Felling Trailers Inc., debuted EZ Tilt technology, which offers safe, quick ground-level loading of a variety of equipment, via its rotating torsion suspension with 5-degree load angle. EZ Tilt specifications include: 18.5-foot tilt deck length, including 3.5-foot approach plate at the rear of t..
Caterpillar is developing EU Stage V-compliant engines across its industrial product line, from the two-cylinder C0.5 to the 12-cylinder, 32-liter C32. Goals for Cat Stage V engines include developing more efficient after-treatment systems, simplifying installation in OEM-customer machines, and prov..
General Machine Products (KT), LLC, a subsidiary of Klein Tools, introduces the Gentle Air Micro Fiber Cable Blower (P/N 89916). Engineered to install micro fiber cable into pre-installed 0.15- to 0.27-inch-diameter microduct, the Gentle Air will place 0.03- to 0.11-inch-diameter cable at speeds up ..
LiuGong North America’s compact 9035EZTS excavator is its first zero tail-swing model in the 3.5-metric-ton class. The rig is an ideal tool for utilities work, residential construction and all other applications benefitting from a mini-excavator’s compact size, ease of transportation and lower cost ..
RIDGID’s new Model 286 Soil Pipe Cutter makes it easier than ever for trade professionals to get quick, repeated cuts on soil pipe up to six inches. Single-stroke operation streamlines the cutting process, while the outward-facing hooks simplify connecting clay and cast iron pipe. The integrated ha.. True Peel tools, from Reed Manufacturing, prepare the ends of PE pipe and tapping tees for electrofusion by removing 0.009 – 0.012 inches of peel thickness to produce a clean surface. Other features include a spring-actuated blade that gives a complete peel, even on out-of-round pipe; observation w..
Toro is expanding its compact utility loader (CUL) product offering through the introduction of the brand-new Toro Dingo TXL2000. Currently in the final stages of development and testing, it will be available in late 2018. With an impressive rated operating capacity, the TXL2000 also features a com..
Safe-T-Stik is a magnetic tag line safety tool for moving heavy, unwieldly, unforgiving and potentially hazardous steel objects at a job site. Comprised of fiberglass, machined aluminum and stainless steel, Safe-T-Stik is lightweight, but its custom-built neodymium magnet has a tested pull force of..
Volvo Construction Equipment Luiz Marcelo Daniel was appointed vice president Hub Latin America-Americas Region, based in Curitiba, Brazil, responsible for strengthening the company’s market position in Latin America, while reinforcing the brand’s global efforts. He brings 30-plus years of experien..
Felling Trailers Inc., received the National Association of Trailer Manufacturers (NATM) 2018 Green Manufacturing Award, which recognizes significant contributions towards improving the environmental impact of manufacturing processes and facilities. Over the course of several years Felling Trailers..
New Pettibone/Traverse Lift LLC dealer, Palmer Johnson Power Systems, now carries Pettibone Extendo and Traverse telehandlers, and Cary-Lift pipe and pole handlers for Southern and Central California. It focuses strictly on the Extendo and Traverse product lines in the state of Washington. Founded ..
ASV Holdings Inc., a Grand Rapids, Minn., manufacturer of all-purpose and -season compact track loaders and skid steers, has added two new dealers to its network. RGW Equipment (Livermore, Calif.) and Thompson Rental Services (Columbia, S.C.) now offer all ASV Posi-Track compact track loaders (CTL..
ALLU Group Inc. has become a member of the Pipe Line Contractors Association (PLCA). Dallas-based PLCA has been a voice for the pipeline industry for 70 years, negotiating labor agreements, encouraging safe practices in pipeline construction and seeking the resolution of problems common to all those..
Kubota Canada Ltd. will move to a new facility it is building in Pickering, Ontario. Covering 565,000 square feet and costing 67 million CAD, the building will house head-office and warehouse operations, and feature enhanced testing, training and warehousing areas, with room for future expansion to ..
CASE Construction Equipment designated Luby Equipment Services as a Precision Construction Certified Dealer. This signifies that Luby Equipment completed the official, CASE-conducted training to guarantee expert selling, support and service of precision construction solutions — from off-machine con.. Plastic Pipes XIX Conference and Exhibition will take place Sept. 24-26, at Red Rock Resort, Las Vegas, Nev. “With the developing list of PPXIX sponsors and the recently released preliminary technical program, the momentum and excitement continue to build for this Las Vegas event,” said Sarah Patte..
Doosan Infracore North America LLC, a global leader in the infrastructure support business, established a multi-year partnership with the New York Yankees. The relationship will provide Doosan with branding and marketing benefits, such as permanent branding at the visiting team’s on-deck location, e..
Customers worldwide traveled to the Perry, Okla., headquarters of Ditch Witch, a Charles Machine Works Company, to participate in the annual Equipment Seminar in April. More than 300 dealership employees and their customers experienced an up-close look at customer-driven equipment enhancements and n..
Ditch Witch, a Charles Machine Works Company, has partnered with Tulsa-based Vacuworx to bring the benefits of vacuum lifting technology to an expanded network of underground construction contractors, landscapers, municipalities and utilities. Vacuum lifting systems are designed to use constant vac..
A large number National Association of Sewer Service Companies (NASSCO) members, spouses and guests converged at the La Cantera Resort & Spa in San Antonio, Texas, April 11-13, for the association’s 42nd annual convention. As always, the attendees tackled many important issues and needs of the sewe..
A four-month study on the review of published literature pertaining to chemical emissions of styrene-based resin used in the cured-in-place pipe (CIPP) process, found that existing studies do not adequately capture worker exposures or levels in the surrounding areas to which workers or citizens may ..
Download PDF of the Pipe Selection Chart ..
A panel of industry leaders participating in an horizontal directional drilling (HDD) roundtable shared a positive outlook for the directional drilling contractors but focused much of their attention on workforce issues that could become even more challenging when business is growing. 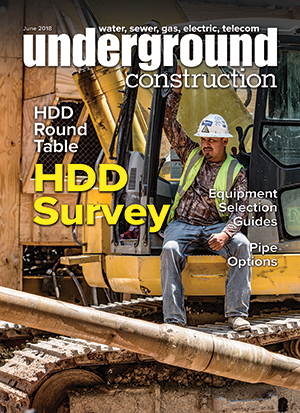 Attracting an..
As the horizontal directional drilling (HDD) industry matures, the underground infrastructure’s dependence on this technology also continues to expand at an impressive rate. The industry as a whole is battling many issues from workforce problems to mud disposal, but still has been able to maneuver a.. The “Smart City” movement has emerged as the dominant trend in the utility industry, as cities and municipalities seek to create smarter infrastructure and improve the lives of the citizens they serve. These cities now look to Big Data and the Internet of Things to create a more connected future, dr.. The need for current and accurate asset data is as real in our industry as emojis are to American teenagers! For over a hundred reasons, owners, engineers, and contractors require accurate measurements of their collection system assets to properly manage and maintain them. This includes pipe inverts.. The redesigned HammerHeadTrenchless.com website gives customers in a wide range of industries even faster, easier access to in-depth information and resources regarding trenchless methods, products and consumables. Consistent with the company’s commitment to providing unsurpassed customer support, ..
Perma-Liner Industries LLC, a North American manufacturer and supplier of trenchless pipeline rehabilitation equipment and materials, earned a Japanese patent. Entitled “Apparatus and Method for Repairing Pipes,” JP 6302418 B2 applies to the equipment and process – involving an air-inversion unit co..
SPX Corporation has strengthened its position in the pipe inspection/rehabilitation market through two acquisitions. Both are complementary additions to its Radiodetection business unit, which has an industry-leading product portfolio of cable and pipe locators, used by utility companies to help ins.. Pipeline trade associations are pressing the Army Corps of Engineers to clarify new, proposed guidelines so that pipeline projects are not unnecessarily delayed because of state and federal bureaucratic review. The Corps issued a draft Engineer Circular (EC) which makes some changes in how the Corps..
Jim C. Scott died Oct. 8, 2017, in Chesterfield, Mo., at age 85. Legendary in the pipeline industry and a pioneer in trenchless technology, he worked for Affholder Tunneling, and then Insituform Mid-America and Insituform Technologies. He also served as a board member of the Center for Underground .. Since early April, the Texas Water Development Board (TWDB) approved financial assistance totaling $187,857,500 for 22 water and wastewater system projects. Among the largest of these projects are: $64,685,000 from the Clean Water State Revolving Fund (CWSRF) to the City of Houston (Harris County) ..
CenterPoint Energy Inc. and Vectren Corporation have entered into a definitive merger agreement. Headquartered in Houston, CenterPoint Energy Inc. is a domestic energy delivery company. Its significant natural gas operations in Arkansas, Louisiana, Minnesota, Mississippi, Oklahoma and Texas serve m..
Capital expenditures (CAPEX) for U.S. municipal water, wastewater and stormwater infrastructure will exceed $683 billion over the next decade, according to new forecasts from Bluefield Research. Improvement plans demonstrate a wide range of capital needs, but distribution and collection networks fo..
by Robert Carpenter, Editor-in-Chief Brown or blackish water comes out of the sink, toilets back up, the television is nothing but snow, internet is down or there’s no signal for cell phones (millennials shudder at the thought). This dark vision is actually happening in one U.S. city and unfortunat..